So as I sit here this morning, I have a lot of things weighing heavily on my mind. My youngest child is having some pretty severe anxiety issues. She has wet her pants once in school and once this morning on the couch. I feel really for her. I think that she is super stressed with school, and her sister going back to stay with her mom. She stayed with us for the summer, and then she went to her moms house for the school year. She comes to visit every other weekend and we see her during the week but it has been really hard for little Miss Brinley. She is so sensitive to Caitlin coming and going. Then skipping a grade and being behind quite a bit and trying to catch up with everything. I think that its harder for me than her almost. Not to diminish what she is going thru because it is really hard on her. I just want her to be okay. I feel like I am sitting here worrying about if she is going to be okay emotionally, and oh so many other scenarios that are playing over in my head. I am so sad for her. She also has anxiety medications but they put her to sleep. I am at kind of a loss because I don’t want her to fall asleep in class so I cut one into a 1/4 and tried that this morning to see if that helps her in school today. I just want her to succeed so bad. I don’t care what she does I just want her to succeed at it. My oldest is having some emotional distress issues regarding to his ASD and we are going to counselling appointments. Things are crazy. His medications are being changed and he I hope will be on a better path do manage his anger and frustration. So that Brinley and Alex can have as good of a relationship as siblings as Brinley and Caitlin. Alex wants to be close to his sisters and Brinley wants to be close to her brother, but I feel like until we get Alex’s emotions a little more under control. I am just so sad for my children because I want them to be happy and successful in life. I feel like I don’t quite know how to help them completely. I am doing everything that I can, physically, and emotionally to help them as much as possible. Why can’t this be simpler? I want to make sure that she is happy and healthy. Sending her back to Kinder is an option but how do I do that without hurting her even more? I don’t know what to do. I feel kinda sick about the entire thing. She knows that she is a 1st grader and then to take that away from her seems cruel. But is leaving her in 1st grade where she isn’t doing very well (because of anxiety) just as bad? I am afraid that we will have the same issues next year as well, just because she is such a mama’s girl. I think some of it may also be just separation anxiety I know that I am feeling it and I can tell that she is too. This entry was posted in Rant, The Kids and tagged 1st grade, anxiety, ASD, autism, brinley, kids, separation anxiety. I ment to upload these pics from the other day. 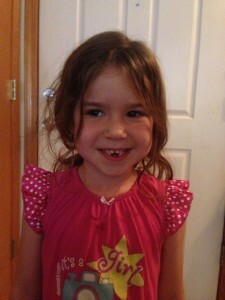 But Brinley lost her first teeth the other day. Well September 10th to be precise. We were sitting and watching a movie when she said “Mom my teeth feel funny when I touch them with my tongue, see?” Well as she went to show me both bottom teeth fell out and she started freaking out because there was a little bit of blood. Thankfully Alex was sitting there with me and he bailed to go get some paper towels for her to chomp down on. It didn’t take long and she was feeling much better going up to tell dad allllll about it. She was quite put out over the whole situation. 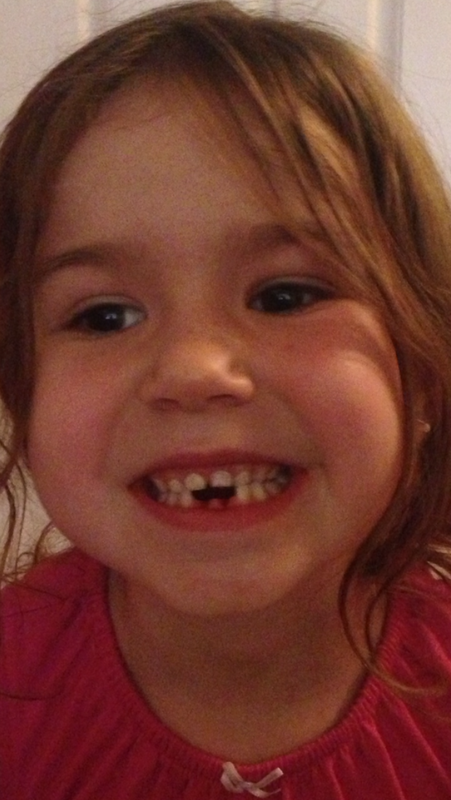 This entry was posted in The Kids and tagged 1st grade, being 5, brinley, loose teeth, lost teeth, Tooth fairy.